In tracing the history of San Vicente, one always one to start from Vigan. Vigan was established by the Spanish colonizer Juan De Salcedo on June 13, 1572 where there only 800 residents . Upon Salcedo’s return in 1574, he brought with him the Augustinians friars in order to teach Christianity to the inhabitants. After Salcedo’s death on March 11, 1576, Franciscan friars replaced the Augustinians in the year 1579. These friars spread up to San Vicente to convert and influence the people to the catholic faith. In 1591, Vigan had already an organized form of government which included these barrios namely : Bo.Tuanong, Bo. Sta. Catalina de Baba and Bo. Caoayan. There was then a population numbering about 4,000 inhabitants. Between the year 1720 and 1737 , the first chapel of Bo. Tuanong was erected. Later in 1748, the Confraternity of Jesus of Nazareth was organized . In one record of the Vigan Convent Archives. a funeral that happened on January 29, 1748 at the Chapel of Bo. Tuanong was recorded. Two chaplains, Bro. Don Agustin de la Encarnacion and Don Pedro Geronimo de Barba were the priest stone of the chapel in the year 1748. It is believed that the chapel in the first stone building that one sees upon entering the San Vicente Central School form the main road. Bo. Tuanong which belonged to Vigan was the old name of San Vicente. On June 16, 1751, the chaplain was Don Miguel de Montanez. He was the first priest there and also in the chapel of San Sebastian. It was found on that Barangay San Sebastian already existed. Hardships in reaching Bo. Tuanong and Bo. Sta. Catalina de Baba from Vigan especially during hte months of June to October was experienced, due to the absence of dike or bridge. Priests from Vigan reached these places by means of a raft. This prompted the separation of these two barrios from Vigan in 1793. In 1795, it was the installation of the seat of municipality and the church , and Bo. Tuanong became San Vicente de Ferrer . Don Pedro de Leon was the first parish priest and he was believed as the initiator of the construction of the church of San Vicente. The municipality’s name came from the name of Saint Vincent Ferrer , whose winged statue was found inside a box entangled in fishing nets. The fishermen consulted this matter to the friars in Villa Fernandina ( now Vigan ), who identified the person depicted by the statue. The statue was carried to the town’s center , where a church was built. From then on, the town formerly known as Tuanong ( sometimse called Taonan) became San Vicente. one town one product or (otop) . The people of San Vicente predominantly spoke Ilocano by 99. 21 percent of the total household population. The few other dialects spoken like Bicol, Hantikannon , etc. had come into the locality due to intermarriages. among all the dialect/ language., other than the mother tongue, tagalog prevails , 22 percent because of education, employment, in Tagalog speaking regions and also through intermarriages belong to the Waray ethic group with only one percent belonging to other groups. San Vicente present administration came a long line of politician which was started when the late Fermin Tabanda was elected Mayor awarded as the longest term as Mayor in the province. As of this time , efforts are done to increase the income of the municipality thru the Tax Mapping being initiated. Barangay Poblacion is at the heart of the town of San Vicente, Ilocos Sur. It is at the center of the six barrios of the town. The church, convent, market, Municipal Hall, San Vicente Central School, Palace of the Governor and many big establishments and residential houses are found in this barangay. It is a place where various shows and fiesta celebrations are held. Furniture shops are also situated in this barangay. Town leaders and famous people also live in this place. With the very reason that this place is the center of various activities and celebrations, and the place of leaders and famous people, it was then called Poblacion. A part in this barangay is a place called “Sanggaan”. It is in this place where people coming from the different barangays of the town gather together. It is mainly because it has become a market place. It was named Sanggaan because according to the elder people, it was a place where game called “Bur-ro”, one kind of gamble through playing cards, are being held. Adult, both male and female, engaged in this kind of game. It was initiated by the Spaniards and inherited by the residents of this place. Since then people started to say “Let’s go to Sanggaan!” From then on, the place was called “Sanggaan”. Another story told by Ms. Crescencia Lucero, retired teacher of Pudoc Elementary School and a member of San Vicente Historical and Cultural Society (SVHCS), that it is called Sanggaan because fights of people usually happens in this place, especially on the use of various weapons. According to her, rivalry occurs between men coming from the east and west of the church. Sanggaan is where they meet together to fight. With this, the place was called “Sanggaan”. Another place in the western part of Poblacion is called La Guerta or “La Huerta”. This name was originated from the farm land which was owned by the late Alfonso Rosal, a resident who was able to succeed in life despite the leadership of the Spaniards and he served as “Escribano”, considered as a high position for Filipinos at that time. La Huerta was filled with various fruit bearing trees like makopa, santol, chico, mango and many others. With this, it was called “La Huerta” or orchard. It was a beautiful place attracted by many people especially the children, where they usually played kite flying. At present, it is in La Huerta where basketball court was established by the residents of the place. It is in this part where it was made the center of the place named “Laguerta” which reminds of the Spanish word “La Huerta”. This story is according to Mr. Fredelito Lazo, Vice President of SVHCS. One place where men usually visit in the eastern side of the national road is Barangay Poblacion, southern part is Barangay Lubong, west-north is Barangay Pudoc, and north of Bantaoay River is Barangay Bantaoay. This barangay is elongated in its area following the national road from the south until the northern part of Bantaoay River. According to the elder people, this place is where men gathers especially in the afternoon because it is where they can find many beautiful ladies and it is where they can gather together to drink liquor in stores nearby. Because the road to this place is moving towards Bantaoay River and it is the nearest place in the river, it was named Barangay Bantaoay. According to Mr. Domingo Romero, Bantaoay River was given that name because of the flowing water from the town of Bantay going to that part. And so the name of Barangay Bantaoay originated from the Bantaoay River, especially so that this river is the main source of living of the people in this place. In the way going to Barangay Pudoc is a Sitio of Barangay Bantaoay named Sitio Baliw. It is located on the western part of Barangay Bantaoay. According to Mrs. Valeriana Ridulfa, retired teacher of Pudoc Elementary School and member of SVHCS, a resident of this place, she’ve known this story from the elders. That according to her, during the time of the Spaniards, there was no other name of this place aside from the name Bantaoay. Long time ago, there was a shallow river along the place where people can get various kinds of fishes and shrimps. During rainy season, water from the fields especially from the southern part, filled the river. Many years passed, people noticed that the river shallowed even more during summer, until no more water flowed from it on the year 1930. Since then, the place became a river bank which was used in farming. People tried to plant rice and they were surprised to see the plants grow robust and they had a good harvest. “What a change in this place!”, said the people. Since then, this part of Barangay Bantaoay was named “Baliw” or change in its English term, because the once river where people catches fish already became a riverbank where they planted rice and vegetables even up to the present. Near Bantaoay River, the northern part of Barangay Bantaoay, was named “Baldi” since the time of the Spaniards, where a group of houses made up of bamboo and nipa are located. There’s a big “Baldi” or old stone structure is clearly seen along the road. During the time of the Spaniards, there were two “Baldi” which were used. Indigo or “tayum” was made into “tina” which was used in coloring pigments of clothe and was used during the time of the Spaniards. This “tina” is believed to be delivered to Spain. Even until now, Baldi still exist in this place. Because of this it was named “Sitio Baldi”. It was believed that during that time this structure was built by a rich man from Vigan, Ilocos Sur, who planted many indigo along the fields. They can easily travel or deliver these indigo by means of riding it in boats going to the sea. This was according to the story of Lakay Ilis Rodillas which is believed that his family was the original leader in this Sitio. 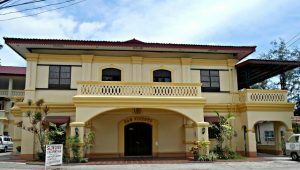 One of the widest barrio/ barangay, the first barangay to reach in the town of San Vicente if you’re coming from Vigan, Ilocos Sur is Barangay Bayubay. Story about how it got its name came from the late Mr. Jesus Paje, a resident of this place. According to him, this barangay was surrounded by four towns, Bantay in the north and east, Sta. Catalina in the west, Vigan in the south and San Vicente in the north-west part. The leaders in these towns were at the east and they were the guide of the people around the towns that’s why it was named “bayabay” or guide. Through the passage of time, letter a was changed to u, since then it was named “Bayubay” up to the present. There’s a part of this barangay which was named “Sinan-aso” because there was a monument which looks like a dog located on the boundary of Bantay and San Vicente facing the east. On the western part of this monument, residents mostly are men who gradually leave the place and went to Hawaii and America. According to Mr. Paje, that is the reason why the place was named “Kabaroan”. On the southern part of Kabaroan, there’s a narrow road and bridge which separates Kabaroan and Sta. Catalina. There was also a River named Mestizo River. The first family in this barangay was Paje Family. The barangay was divided into two during the leadership of Mayor Fermin Tabanda, Bayubay Norte and Bayubay Sur. So during his administration, these two barrios was made into barangays. The area of Bayubay Sur starts with the boundary of Bantay and San Vicente, south of the National road, from the old Bayubay until south of the road going to Sta. Catalina. On this place, there was a river named Mestizo River which was told by Mr. Constante del Castillo, a resident of this place. Bayubay Norte starts on the western part of the boundary of Bantay and San Vicente, north of National road, from the old Bayubay until east of Lagasca road, until Rizal street. Part of this barangay are places like Nalasin, Kamoruan and Tuanong. As narrated by Mr. Graciano Pingil, Nalasin is near the boundary of Bantay in the east and which was separated because of its small population, which only started with the residency of Pingil family in the place. On the western part of Nalasin is a placed named Tuanong. According to Mr. Pingil, the residents of this barangay are believed to be thrifty and stingy. Revilla Familla is known to be the famous and richest family in this place. On the northern part of this barangay is a farmland named “Pagkabitinnian”, because of the rice plants which was only harvested in the month of November. Now, people already forgotten the name of this place, that everytime someone would ask, they would simply say “taga daya’t simbaan”. There is also a place in Barangay Bayubay Norte named Cantanasio. A concrete well with delicious and sweet water was found in this place. It was named Cantanasio by the residents because it was believed that this is the place where many love stories were built. It was originated in a love song from the heart and lips of the concerned lovers. Gentlemen and ladies embraced each other when they go and fetch water in the well especially in the afternoon. From then, songs (canta) of love (nasio) can be heard. That’s the happy place of Cantanasio. Another story about a place which was told by Mr. Graciano Pingil was the place named Kamoroan because according to him, the residents are violent. In the mid of the night, one can hear the loud voices especially when they had a fight or quarrel. According to him, because of the violent people in this place, the place was called Kamoroan. It was so because Moros are violent people. The famous family in this barangay was the family of Adiang Rialubin. Like Tuanong, Nalasin and Pagkabitinniaan, it was already forgotten by the town people so they would just say from Crisologo Street when somebody would ask a resident from the place. Another part of Bayubay Norte, a road which starts from the National Highway north side which was called Calle Crisologo in memory of the late Congressman Floro Crisologo. He was the one who donated the fund for the improvement of that road, under the administration of Mayor Fermin P. Tabanda. At the end of Bantaoay River is a place in the northern part of Bayubay Norte named “Soyosoy” even up to the present. This place is a way of water coming from the town which flows until this part. The largest part of this place is owned by Rosal Family and Mata Family. A place where people catches fish because of its abundance. According to the caretaker of this place, Pastor Pescador, this is the story why this place was named “Soyosoy”. According to him the term “Soyosoy” originated from his grandfather. There was once a family who lived in this place who was led by a person named Andoy. Every afternoon, he went to catch fish in the flowing water using “suyod”. One afternoon, he commanded his child to bring with him the “suyod” he would use in catching fish and he said “Mo ta suyod soy…” Andoy wasn’t able to continue what he would have to say because he already lost his breathe and died. The child immediately called his mother and told to her “mo suyo-soy”. Since then this place was named “Soyosoy” in memory of the last words uttered by the caretaker of this place. One of the seven barangays of San Vicente is Barangay Pudoc. Surrounding this barangay are Barangay San Sebastian in the north, Bantaoay in the western-southern part, Lubong in the south. There are lots of stories about how this barangay was named Pudoc. But one of them is believed to be a real story. It was namede Pudoc because of the warm climate, because of its nearnest to China Sea. During the Spaniards time when they colonized the north, the people who lived in this place were big and strong. Despite of these qualities they possessed, they weren’t able to survive the heat. Because of this, they unexpectedly would utter the word “napudot”. The Spaniards who would visit them would hear this word “Pudot”. That place was then named Pudoc even up to the present. During that time, there were only two sitios comprising Barangay Pudoc. These were Pudoc Norte because it is situated on the north, and Pudoc Sur, because it is situated on the south. The famous families who lived in these places were Bundoc Family and Rubia Family in Pudoc Norte while in Pudoc Sur, Rosales Family, Rojas Family and Ranches Family. With the passage of time, one sitio was created on the middle part of these two sitios. It was named Pudoc Centro because it was the center where the elementary school is located. Retuta Family was the first family who lived in this place. Next to the creation of Sitio Pudoc Centro is Sitio Nagtupacan which is located western part of Pudoc Sur and along the China Sea. Based from the stories of the elder people, the first people were not from Pudoc nor residents of San Vicente. They came from the neighboring town of Sta. Catalina, because they searched for a place where they can find a better means of living. Since they stayed in this place, they have found comfort and also it is here where they found their main source of living, farming and fishing. So they carried all their belongings, they went to the place as one group they all dropped (“nagtupak”) in only one place. There they named it “Nagtupakan” which is now Sitio Nagtupacan. Two families were known to be in this place, they were Noel Rualizo in the western part of Nagtupacan and Berto Racoma in the eastern part of this place. Another story about how the name “Nagtupacan” was originated was told by Luciana Riguera, a retired teacher of Pudoc Elementary School, who based her story from the late Gregorio Riguera, born on 1887. That according to her there was an image of St. Vincent Ferrer which they found in this place. Because of this, the people here in this place agreed to name the place Nagtupacan as a means to remember the finding of St. Vincent’s image in their place. The Parish Priest and Gobernadorcillo before even agreed that this place be named Nagtupacan because it is a place chosen by God where the image of St. Vincent Ferrer fell. Since then it was named “Sitio Nagtupacan”. One place located in the middle part of Pudoc Norte and Pudoc Sur and Nagtupacan, is a about one hundred hectares part of water which is named Subec. It was a place where fishes stayed and taken cared of, and it is where people can get ingredients or materials used in making salt. Subec was the name the people gave to this place because it is considered the mouth of the water from the sea and river of Pudoc and Nagtupacan which is moving towards Bantaoay River. Subec is a part of Pudoc. It was said to be owned by the Lazo Family, Yanong Lazo, who is the brother of the late Fr. Melanio Lazo. The place was then sold to Tabanda Family. A story about how this barangay of San Vicente was named Lubong. This story was told by the late Guillermo Rubio, one member of SVHCS, a resident of Barangay Lubong and was one of the Sangguniang Bayan Member (SBM) of the town. This story was told to him by an old man when he was still young. According to him, when the Spaniards had established their leadership in Vigan, Ilocos Sur, one happy event became the reason for naming their place Lubong. During that time, the Spaniards and the rich residents of Vigan were naming that place “Kasakateruan”, a place for people, both male and female, engaged in grass cutting as their means of occupation. People went to sell the grasses to Vigan, especially to people who owned horses. One the other story, residents of San Vicente named this place “Kasarguelasan” because there are lots of big trees of “sarguelas” sprouted and grew in that place. Because it was already a long been plan of the residents to change the name of their barangay in a more pleasant and a more respectable name, families of Reclusado, Rubio, Ricana and Golino decided to name their barangay Lubong to remind them of the falling of “Lubo” in their place. Since then, Lubong became the official name of this barangay. During the old time, San Sebastian was a part of San Ildefonso because of its nearness to this place and the presence of Bantaoay River which separated San Sebastian and San Vicente. But because of one influential person, Lazo family, who became Judge in the Province of Ilocos Sur and Ilocos Norte, San Sebastian became a part of San Vicente as one of its barangays. On the other story, one elder professional said that San Sebastian was really a part of San Ildefonso but because of the help of Vicente Encarnacion, Fiscal General of Ilocos, it was made a part of San Vicente. The presence of the Bantaoay River which separated the places, did not hinder San Vicente from making San Sebastian a part of this town because of the great help it can brought to the progress of the town because it is where people can get fishes and salt was made. The people have chosen the name San Sebastian because of the presence of a wood image of St. Sebastian which was donated by a rich woman from Vigan who was known to be Dona Encarnacion. The first sitio of San Sebastian after Barangay Bantaoay, passing by Bantaoay River is Sitio Urdas. Most part of this place are considered situated hillside, but on the other side of the road is lower. On this place is Bantaoay River, with clear water and deep river which is approximately 20 feet deep. Bantaoay River was given its name because the river passes by the “away” of Bantay is San Ildefonso. That’s why the people named the place, “Bantay-away” in short “Bantaoay”. The place at the northern part of Bantaoay River was a part of Bantaoay. But people said that names of the places should not supposed to be the same. One significant event happened which was the reason for changing the name of the place. One battalion headed by the Spaniards was met by a group of Ilocanos who came from the east. The leader of the Ilocanos shouted “Agurdas kayo! Agurdas tayo!” Because many of them did not understand “agurdaskayp”, he repeatedly say “Urdas! Urdas!”, which means crawl and walk with your ankle. Since then the place was named Urdas. One can still see in this place the old buildings built by the Spaniards who stayed in this place. It was believed that one Jesuit Priest lived in this place. There was then a monument built which us believed to be a face of a person but now its only the head which only appears and still seen. There still exists the roads which crosses in the middle of the twenty three hectares of land of Urdas owned by Dona Encarnacion, after the Spaniards and sold to Ariston Florendo, rich men from Vigan, Ilocos Sur. There was six-hectare part of Urdas which was owned by Titong Villanueva from Vigan who surveyed this part, because it was not stated in the Declaration. The first townpeople of San Vicente who lived in this place is the family of the late Primitivo Rebebes. His grandson named Epifanio Rebebes told that he is the one taking care of this place, and said that this place is believed to be forest-liked. This place is now known as “Urdas”. In the north-western part of Urdas is Sitio Sagsagat. It was named Sagsagat because trees named Sagat were found in this place. It was believed that one Guardia Civil asked what the big trees are. One old man answered “Sagsagat”. Since then the place was named “Sagsagat”. There are other sitios of San Sebastian which nobody knows how the names originated. According to most of the residence of these place, the name was given as agreed by majority of the people. Each sitio was then named by the people residing in it. These are the other sitios of Barangay San Sebastian: Ermita East, Ermita West, Mindoro, Quinabarangbangan and San Sebastian Proper. MARIA TERESITA R. GAPATE, Ed.D.